Christopher M. Mayer is publisher of The Boston Globe and the head of the New England Media Group, both of which are subsidiaries of The New York Times Company. He is responsible for The Boston Globe and Boston.com; the Worcester Telegram & Gazette; and GlobeDirect, the Globe’s direct mail subsidiary. Mr. Mayer also oversees the Company’s investment in Metro Boston, a free daily newspaper. Mr. Mayer joined The Boston Globe in 1984 in the information services department. He was named senior vice president, circulation and operations in 2008, overseeing production, advertising operations, circulation marketing and distribution. Previously Mr. Mayer served as chief information officer and senior vice president, circulation, among other positions. He also served as senior vice president of Community Newsdealers, the former home delivery subsidiary of the Globe. Mr. Mayer received a B.S. in computer science from Yale University. He lives in South Boston with his wife and four children. 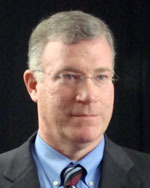 Christopher Mayer, publisher, The Boston Globe, who started at The Globe in 1984, was appointed publisher in January 2010. Mayer, who oversees a newspaper organization of about 1,400 employees, says he is committed to maintaining “original reporting and quality coverage” for his community. Christopher Mayer, publisher, The Boston Globe, says his newspaper restructured its deadlines in 2010 and was able to close one of its two printing plants to reduce overhead. By staggering its deadlines, printing runs that used to begin late in the evening now start at 9 a.m., daily, with non-time-sensitive materials. Christopher Mayer, publisher, The Boston Globe, says the The Globe will institute a “two-tier strategy” for its website in 2011. The newspaper’s current website, www.boston.com, will remain free. A second website, www.bostonglobe.com, with the complete contents of the newspaper, will be offered behind a paywall in order to create a new revenue stream to offset newsgathering costs.